Type: EQUIPMENT. Detail: PLASTIC. Product Code: PCSBROWN. A school and chess club special offer. 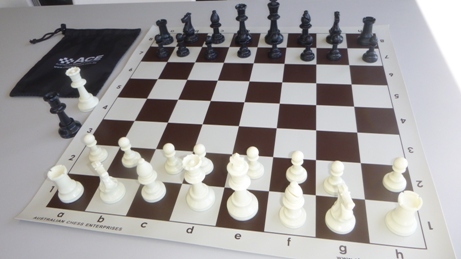 A plastic tournament chess set, roll up vinyl board with white and brown squares and also a drawstring bag to help keep the pieces safe and tidy.